This week I received a new shipment of Polycom phones to demo putting me in phone nerd heaven with a box of new toys to play with! Why all this excitement? Well included in this latest shipment if the Polycom Soundpoint IP 670, the flagship product of Polycom’s IP phone lineup. As you may already know, BitWare Technologies is a certified reseller of Polycom phones. After trying several IP phone brands with our phone systems over the years we settled on the Polycom lineup because of their outstanding quality, great value, exceptional voice clarity, and long history in the industry. We have always been impressed with Polycom’s IP products, but their new line of IP phones featuring HD Voice, faster processors (shorter boot times), and enhanced user interfaces raise the bar even higher. Polycom describes the Soundpoint IP 670 as “a premium SIP desktop phone with color display that delivers a rich voice, visual, and applications experience”. 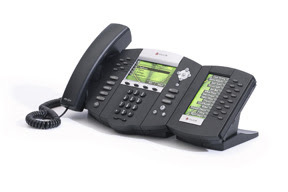 With 6 line keys, a number of soft keys for custom applications, full duplex speaker phone and support for up to three expansion side cars (providing up to 42 additional speed dial keys), this phone is perfect for executives, receptionists, and power users who require an expandable platform. The most noticeable feature of this phone is the 320 X 160 pixel color display. The large color display features images for customizable backgrounds and colors to enhance the viewing experience. Backgrounds and colors even extend to the optional color expansion sidecar. From the display you can easily view contacts, watch the status of other phone users in your buddy list, and access all the features of the phone. Wideband HD voice is now available on the Soundpoint IP 670 and other models including the IP 650, IP 560, and IP 550. Anyone familiar with voice over IP will tell you that voice quality starts with the phones. Now with HD voice, Polycom’s already legendary voice quality is even better. HD voice provides twice the voice clarity of a traditional phone call. In addition, Polycom’s HD voice technology uses their patented Acoustic Clarity Technology 2 to process voice, cancel echo and reduce background noise. Enhanced quality ensures that every word is heard the first time, and conference calls are Chrystal clear! While HD provides the best voice quality currently available there are some limitations. Current phone lines are limited to half the audio rate of HD voice. So, for now HD voice is confined to IP networks, however, users of this phone will still benefit from Acoustic Clarity Technology providing voice enhancement for both HD and non-HD conversations. The Soundpoint IP 670 ships standard with Gig-E and support for 802.3af power over Ethernet. For anyone working with bandwidth intensive applications on a gigabit network this is a must. Most IP phones are limited to 100-megabit Ethernet ports. Since IP phone users daisy chain their PC to their IP phone through the integrated two-port switch, a 100-megabit reduces a desktop’s network performance by ten on a gigabit network. Believe it or not, most IP phone manufactures are behind the power curve on this feature and do not offer integrated gigabit Ethernet through their phones. Polycom currently builds gigabit Ethernet into the Soundpoint IP 560 and Soundpoint IP 670 phones. One recent BitWare customer chose Polycom Sound IP 560 for their new BitWare Unified Communications Server phone system in large part because of this feature. The Polycom Soundpoint IP 670 is one awesome phone! It’s difficult not to look cool with one of these sitting on your desk. The customizable color display is by far the most differentiating feature of this phone. Combined with a color sidecar this great looking phone becomes a highly expandable platform supporting up to 32 extension line keys and up to 42 displayable speed dials with presence. The integrated gigabit Ethernet is a must for any office with a high-speed network. HD voice is a great technology investment ensuring that your phone will be able to converse in wideband as the proliferation of convergence continues. • Wideband HD voice is limited to IP networks.